Abdul Hamid has the wide-open smile of a child and the eyes of an adult. 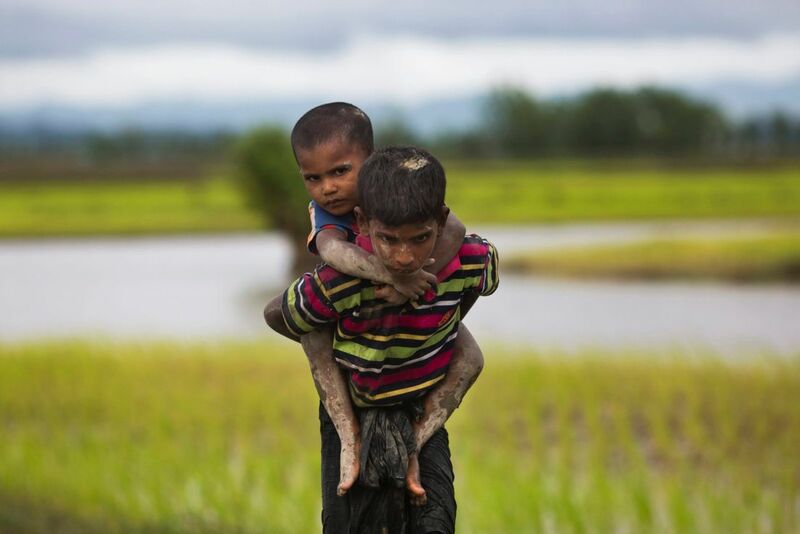 By age 12, the Rohingya Muslim boy has seen more than anyone should have to see in a lifetime. He saw his father shot by "Burma soldiers," he volunteers in a calm yet deeply unsettling tone, lifting two fingers of his right hand to illustrate the act. When his father didn't die right away, he saw the soldiers slash his throat. His mother fled their home in Myanmar with Hamid and four younger siblings. They hid in forests for days and then walked for two days to reach the safety of Bangladesh. Now he is the "elder" of his family, he says. So he tries to provide for them — as best he can in a place where hundreds of thousands of people share his family's desperation. 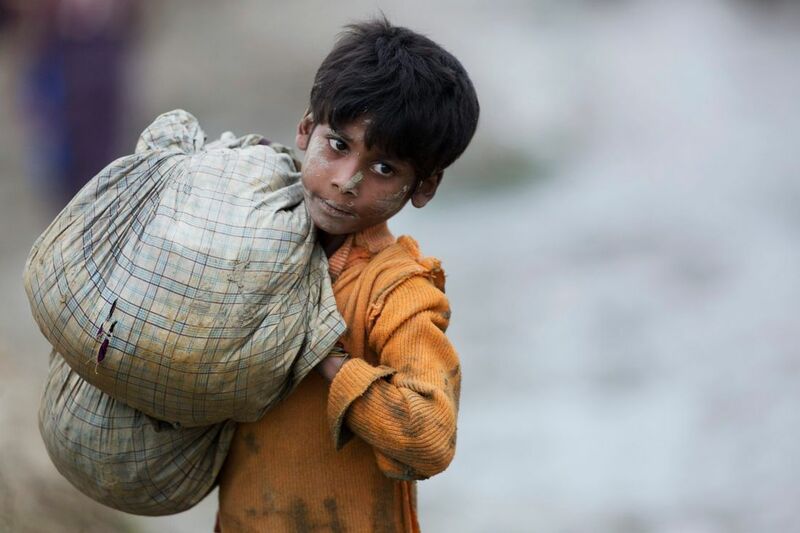 He stands on one edge of a vast, muddy field with a group of other boys, hoping that a passing aid truck will throw him some packets of food. Children make up about 60 percent of more than 420,000 people who have poured in to Bangladesh over the last four weeks— Rohingya Muslims fleeing terrible persecution in Myanmar. They have seen family members killed and homes set on fire. They have known fear and terror. And they have endured dangerous journeys through forests and on rickety boats. Sometimes they've done it alone. UNICEF has so far counted more than 1,400 children who have crossed the border with neither parent. 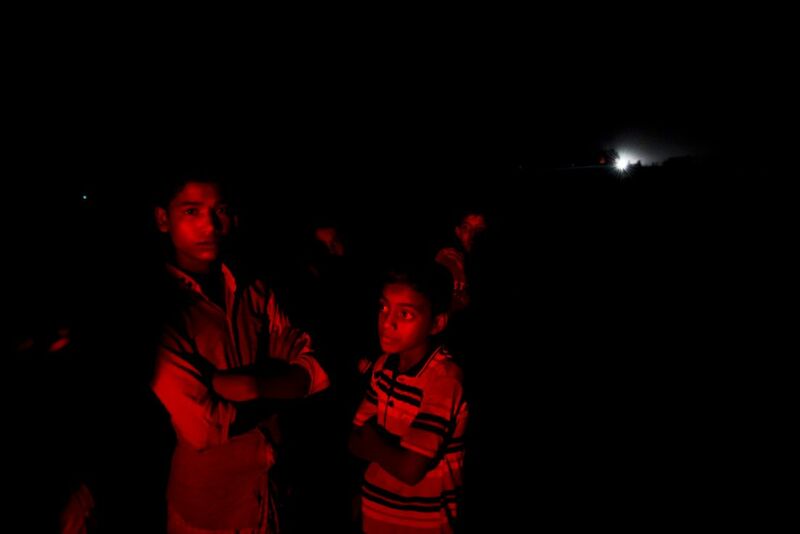 Now they've traded the fear and terror of Myanmar's northern Rakhine state for the chaos of refugee camps in Bangladesh. Tens of thousands of strangers live cheek by jowl in normally uninhabitable places are hardly the safe havens that nurture a childhood. Hunger is a constant and most children have to beg at some point if they are to eat. To do that, they have to leave their tents. Their parents, who are simply too overwhelmed and impoverished themselves, cannot chaperone them. Most of the babies are sick, burning with fevers or suffering from diarrhea. Clean water and toilets are so rare as to be nonexistent. "These children have been through a terrible experience. 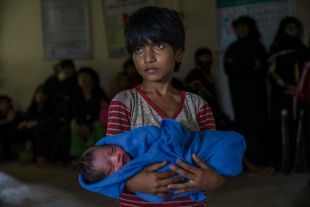 They are heavily traumatized," says Fatema Khyrunnahar, a child protection officer with UNICEF who is working to set up what the agency calls "child friendly spaces" within the squalor and misery of the Rohingya camps. These are rare spaces where these children can be around each other. Play and sing and shout and have books read to them. And in a small room that was built just a week ago in this refugee camp, they seem to do just that — at first. But of course the children of Balukhali and other refugee camps need more. And you only need to look closely at the children in the small room to see the wariness and sadness. Their bodies are tense. Their eyes dart around. "They are under so much stress," Khyrunnahar says. She has worked with children in distress before but says the tragedy of the children in these refugee camps sometimes overwhelms her. They need counseling — first to express their trauma and perhaps later, if they are lucky, to let it go. There's a 10-year-old boy who crossed the border clutching his 6-year-old sister. A neighbor brought the two children after both their parents were killed. "For many days he did not speak," Khyrunnahar says. Finally, he said, "The family he stays with does not love me." "He loves to be held and hugged. He clearly missing that," she says, but she also understands the problems of the family that brought him to safety. They're struggling too. The problems are enormous. Aid agencies like UNICEF and MSF who are working with children in these camps say they're barely scratching the surface when it comes to addressing their mental and physical well-being. "We're very worried about the scale of the crisis and the gap there is" between the need and available aid, says MSF's project coordinator for emergency response in Cox's Bazar, Arunn Jegan. "Such a large number of children without caretakers are extremely vulnerable," Jegan says. Trafficking, servitude, sexual abuse and getting separated from their families are some of the fears that lurk here for children. Their circumstances have turned them into adults well before their time. Eight or 10-year-olds are caregivers and guardians for their toddler and infant siblings. They stand on the roadside, babies on their hips and in their arms, waiting endlessly for the trucks that distribute food aid. It doesn't take long for a chaotic scene to break out. A van of local volunteers may drive by, tossing out packets of biscuits or water bottles or even money. Large groups of Rohingya standing along the road start running after it, men, women and children. It's easy for children to wander too far away from home. They get confused about direction, simply following other groups of kids or adults to places where they think they might get some food or other relief material being handed out. That's what happened to sisters Majidia and Jasminara, who appeared to be about 10 and 6. As aid trucks pulled into a food delivery area they lost track of their sister Dilnawaz. She is younger than Jasminara, the older girl said as she sobbed inconsolably. "I told her not to go. I told her not to go," she kept repeating as tears poured down both their faces. But the little girl, likely hungry, just vanished into the crowd: easily more than 5,000 people corralled by police and soldiers. The sobbing girls waited surrounded by a growing crowd. Public announcements were made. More announcements were made. The once somewhat organized crowd that was waiting for food became chaotic as people walked away with bundles of rice. Little Dilnawaz didn't make her way back to her sisters.